Today’s Monday Map looks at the growth of property taxes between 2009 and 2010. The basic metric we use to judge property tax levels is the median real estate tax divided by the median home value. This figure more than doubled in Louisiana, rising over 140% (though it should be said that Louisiana still ranked lowest overall in 2009, and only jumped to 3rd lowest for 2010.) North Dakota and Indiana are the only two states that saw a decrease. 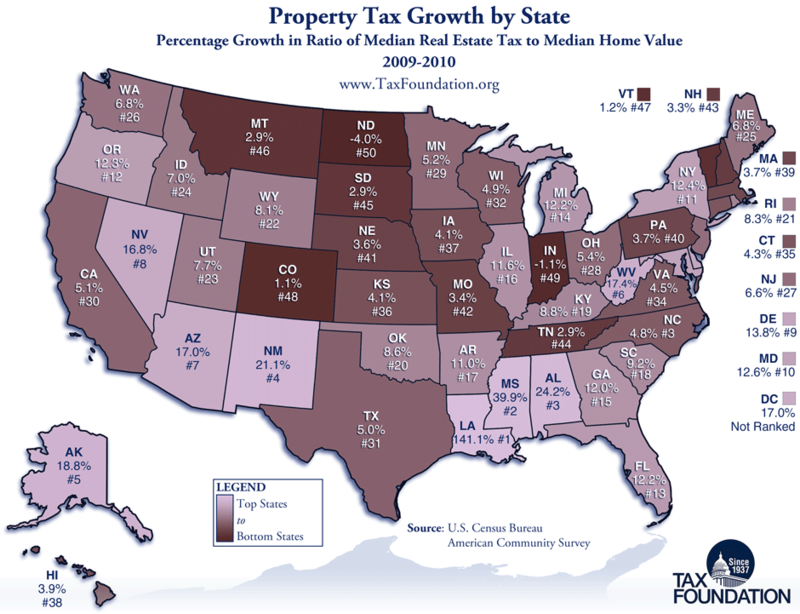 Update: A few readers have written in asking me to emphasize that the map is showing the growth not of the median property tax amount, but rather a rough measure of the median effective property tax rate, which is true. There’s growth in this metric across the board, and one of the main causes is that assessed home values take some time to catch up to actual market values. In a period of decreasing home prices, that means higher effective property tax rates.